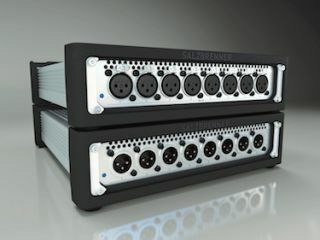 The What: Salzbrenner Stagetec Mediagroup will feature its NIO xcel Series Dante Enabled Format Converters at InfoComm. The What Else: Consisting of four models, these I/O stage boxes are ideal for theaters, churches, performing arts centers and other demanding audio applications where high quality sound is essential. In addition to offering redundancy in Dante network connections as well as in their power supplies, these units ensure perfect synchronization—even across several switches. Designed for maximum flexibility, the NIO xcel 1201, for example, is equipped with excellent microphone preamps and a 4-way splitter for each microphone input, enabling independent feeds to FOH, Monitorworld, the broadcast vehicle, and a recorder. All NIO xcel models are equipped with two Ethernet ports to be connected to a redundant network structure or they can be daisy chained. The Bottom Line: The xcel Series will be available in August of 2016.